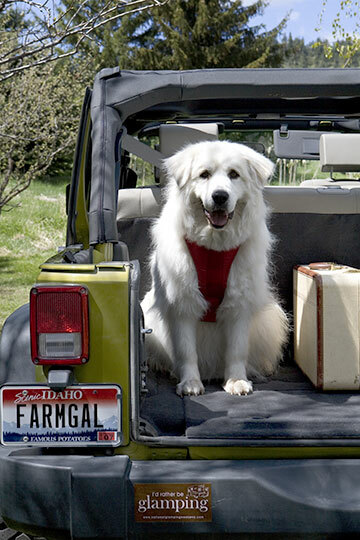 My gentle giant of a dog, Tulip, a Great Pyrenees, is a dear buddy ’round the farm. Retired after years of protecting livestock for another farmer, she hangs around looking doe-eyed, hankering for full-body rubs. I have often wondered what goes on in her doggy mind when she takes off into the hills—lucky for me she likes home best. Here she is in the back of my Jeep, all suited up in her harness for an adventure with me (a harness keeps not only the dog safe but the driver and passengers safe also). 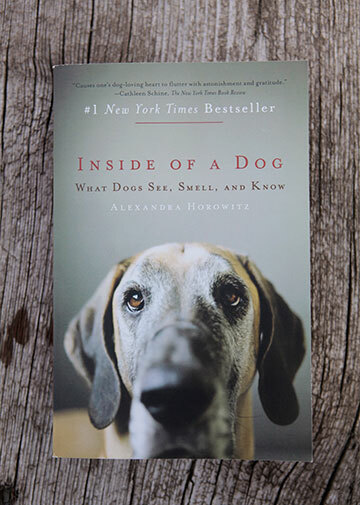 … reading the book Inside of a Dog, by Alexandra Horowitz. Fascinating book! Did you know the combination of dogs’ attention to us and their sensory prowess is explosive? They can detect our health, our truthfulness, even our relation to one another. And they know things about us at this very moment that even we can’t articulate.